This photo was taken on June 15, 2014 at 4:01 PM. The location was on my street in Bethesda, Maryland. The "Take It!" came from making this very familiar drive on my street at a time in the afternoon that finds the sun casting a shadow of the power lines that border the street - into the street. The shadow fell in my lane and was what I had seen for many such trips before. My thought moved over to "Let's do something with this very recognizable shadow that is very different and fun" I pulled over and parked, got out taking my camera with me. And where this came to me from - I have no idea - I immediately knew it was time to try my hand at that age old game of "Power Grabbing" only this time it was in a completely different context and fully without chance for harm. In less than a moment I had found the proper place to stand and raise my clenched fist to give the appearance of having taken a hold on the power line. The holding of the camera and bringing it into place in front of my torso took a few minutes to put into place. 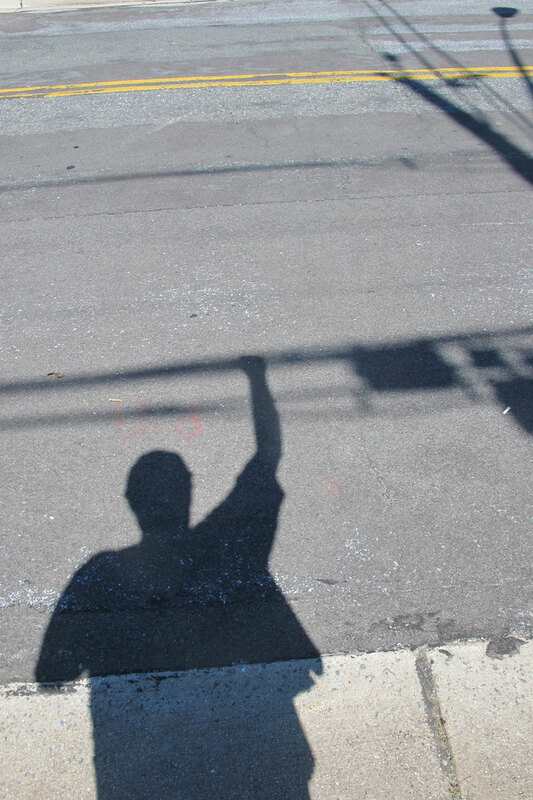 The bending of my arm at the elbow to bring the camera into this position has the shadow looking like I lost part of my left arm. I think with more practice I could eliminate the loss of my lower left arm in the shadow casting. I took five shots and found the best just happened to be the first one - lol, So much for practice - lol. I have to confess - I was thrilled at having recieved the gift of the idea on how to make the photograph. The conversion of the common term for making photographic self portraits came later - and was also an enjoyable gift. The After Take: Everyone enjoyed the photograph and just as much the story of how it came to be. I always make certain to attribute the gift of these things as coming to me from quite somewhere else. My gratitude for this gift is ever ongoing. Here is hoping this one brings a laugh or a smile - for that is its intent. PS: Should you try this for yourself - Please be very careful and watch out for traffic! I like this idea, although in a group shot it may make pointing out whos who difficult. I'll have to see if I can get my kids to do something like this. Momma needs distractions during the summer, I'm sick of hearing "I'm bored!" Almost looks like you are hanging from the wires. This style sure beats the regular selfies, which I never understood. I like the name designation you have given it. I can also only imagine what other passersby must have thought you were doing that.